It is 10 years since the terrorist attacks of September 11, 2001. This anniversary is commemorated with a new terror alert for New York City and Washington D.C. which brings even more attention to this year's time of remembrance. 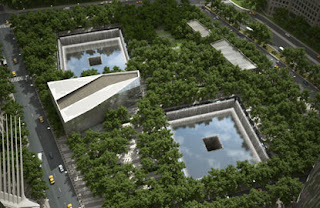 A new memorial with reflecting pools is opening in New York at ground zero. Americans are united for this day before returning to the usual political polarization and bickering which is keeping the country from effectively dealing with current problems. We are hopeful and thankful for our freedom and rights which have been preserved. We are thankful that through vigilance we have been spared a recurrence of the horrible events of 10 years ago. We are sad that so many have been harmed by wars in Afghanistan and Iraq which followed the events of September 11. The mastermind of that day, Osama Bin Laden, was finally killed in a battle with US forces in May of this year after he had been secretly living in a suburban home in Pakistan as authorities there turned a blind eye. His organization Al Qaeda continues his work and the world is as dangerous and full of hatred as it ever was. Canadians join Americans in the grief of the events we now commemorate. We think of those killed in the attacks including people from many countries including Canada. We should also think of the traumatized survivors who escaped with their lives but they continue to suffer indelible memories of the horror they experienced. We think of the brave passengers and crew of flight 93 which crashed over Pennsylvania as they fought off terrorists who had taken control of the plane. Those people heard what had happened to the World Trade Center in New York and could only imagine how their plane would be used if they did not stop it. We are grateful for our freedom and I hope the unity of this day will continue. Since 9/11 I have had a tradition of holding a mediation on that day where possible and since it is a Sunday I have a mediation set to go on Monday September 12. Let us all work to resolve our differences and to co-operate more for the common good.